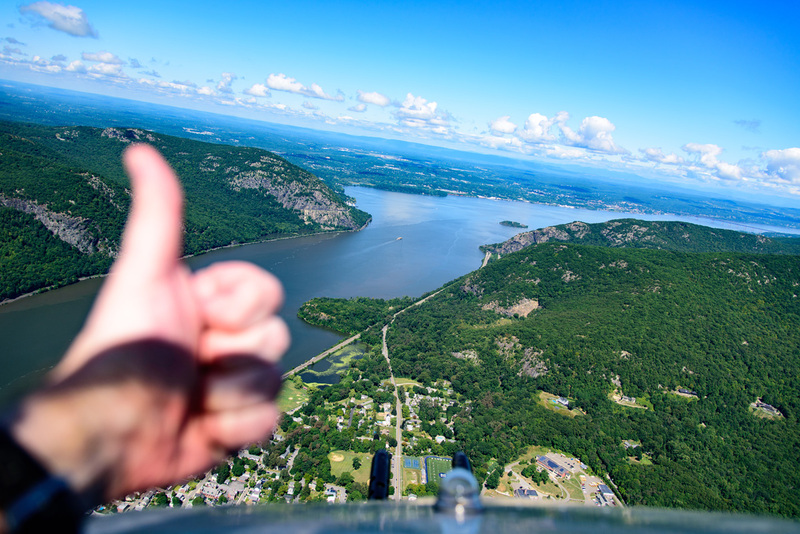 A firsthand account of one lucky photographer’s flight aboard Panchito, a B-25J Mitchell bomber owned and operated by Larry Kelly during the inaugural 2015 New York Air Show at Stewart International Air Port. Anyone familiar with the B-25 Mitchell will immediately associate this warbird as the aircraft that completed the historic Doolittle Raid over Tokyo in 1942. However, the B-25 played a much larger role in WWII. Nearly 10,000 B-25s were built throughout WWII and they saw service in all theatres of the war including Alaska, North Africa, China, Europe, and the Southwest Pacific. 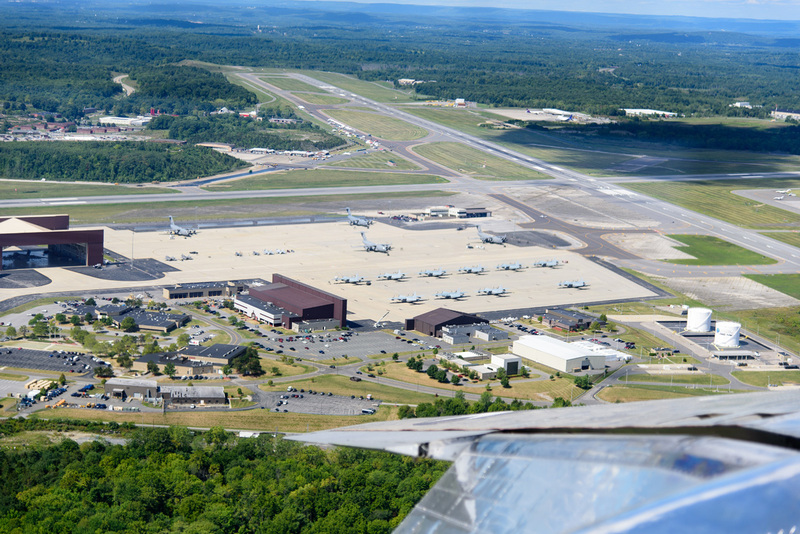 Named for famed airpower pioneer Brigadier General William “Billy” Mitchell, the B-25 was designed as a medium bomber to operate from altitudes between 8,000 and 12,000 feet. 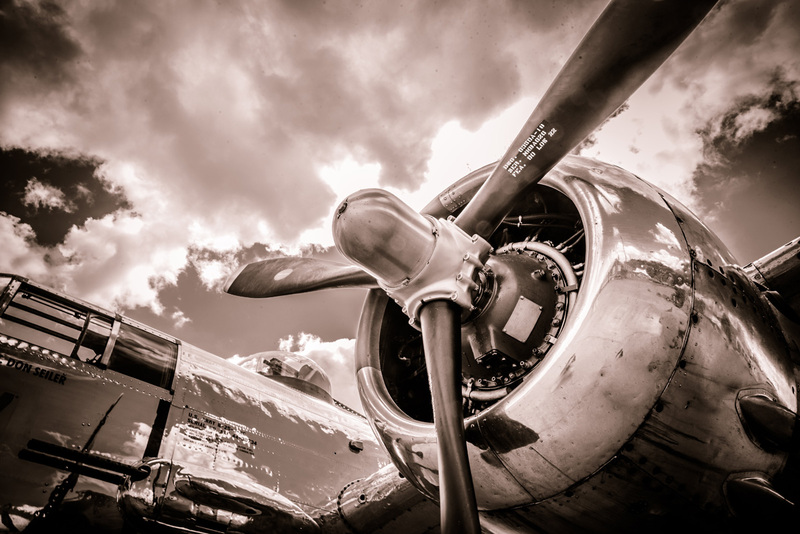 Powered by two 1,700-hp Wright R- 2600 engines, it became standard equipment for the Allied air forces in World War II, and was perhaps the most versatile aircraft of the war. It became the most heavily armed airplane in the world, was used for high- and low-level bombing, strafing, photoreconnaissance, submarine patrol, and even as a fighter. Normal bomb capacity was 5,000 pounds (2268 kilograms). Some versions carried 75 mm cannon, machine guns and added firepower of 13 .50-caliber guns in the conventional bombardier's compartment. 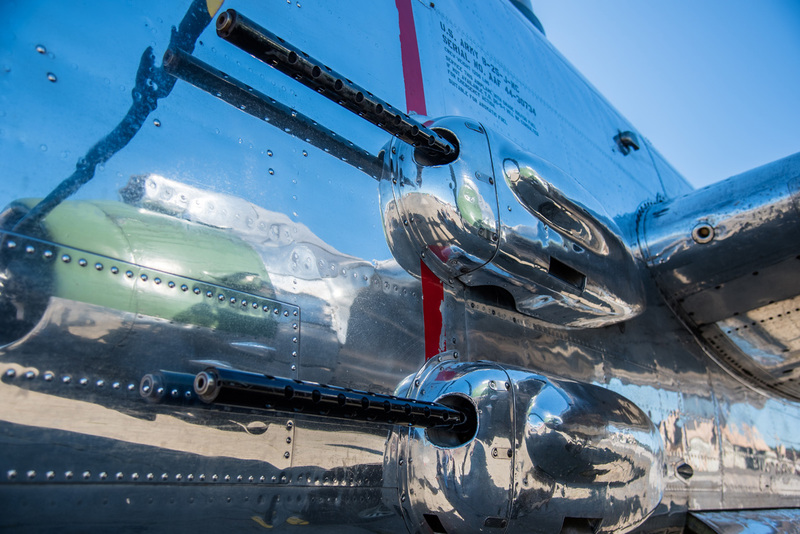 One version carried eight .50-caliber guns in the nose in an arrangement that provided 14 forward-firing guns. 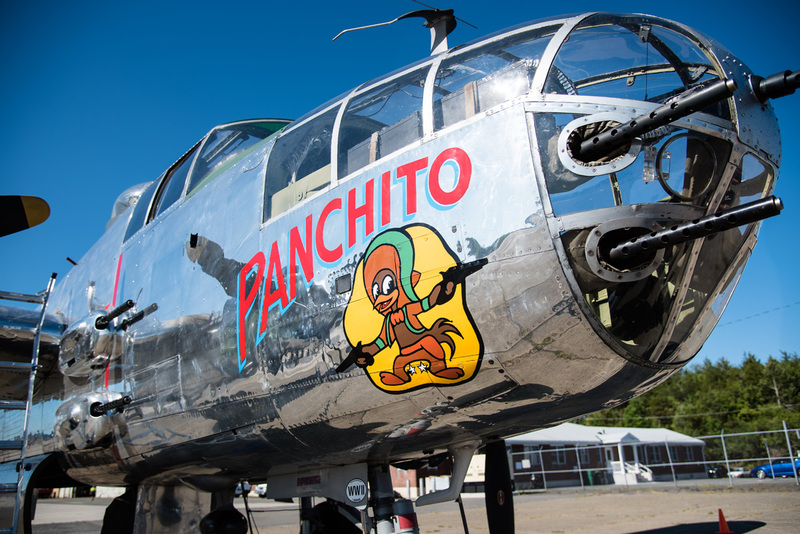 The original Panchito (B-25J, serial number 43-28147) was assigned to Captain Don Seiler of the 396th Bomb Squadron. Capt. 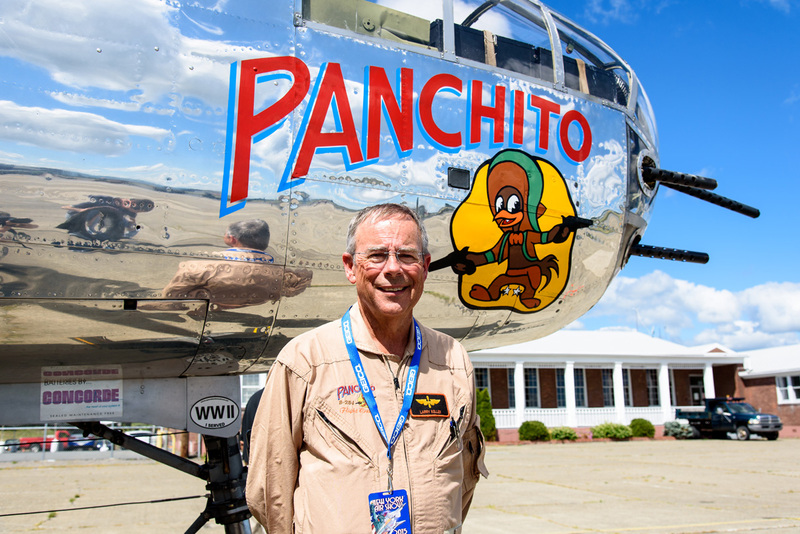 Seiler named his new plane “Panchito” after the feisty Mexican rooster from the 1943 animated musical “The Three Cabarellos”. 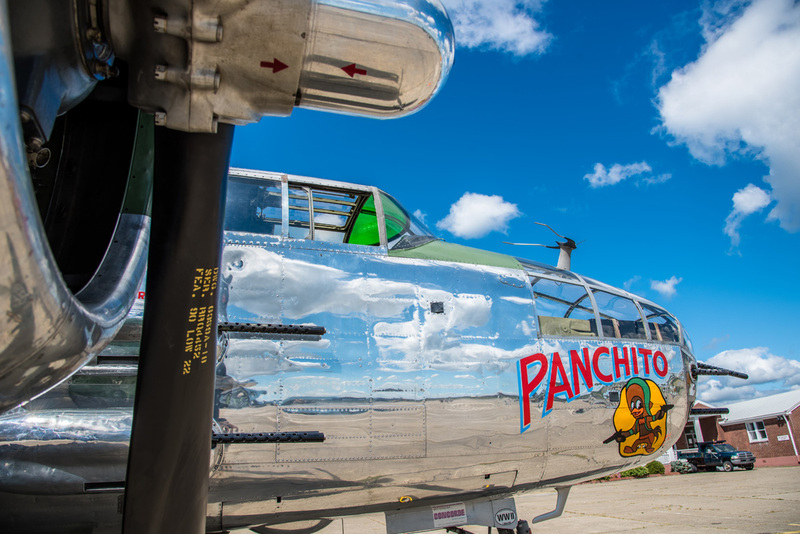 Before I sat down to write this article, my intention was just to recount the sights, sounds, and feelings I experienced during my flight aboard Panchito. Some of that is still here in this article, so don’t give up on me yet. However, after reliving this experience in my mind, reviewing the many photos, listening to the audio recordings I captured while talking with Panchito’s owner/pilot, and then talking with my father about it all, I realize that this experience was not about me or about the B-25. 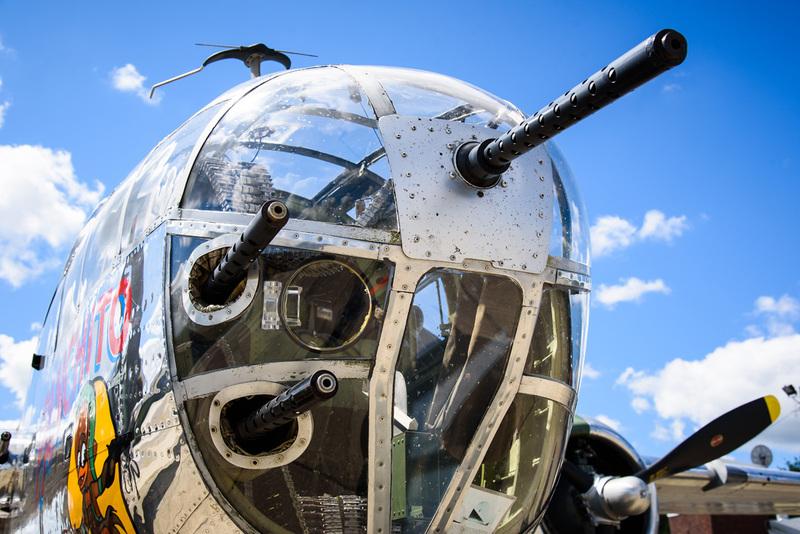 It was about what this B-25 and her owner/operators represent and what they are doing through their efforts to maintain this aircraft and reach out to the veterans who have a real life connection with it as well. I found my own connection went well beyond my love of history, aviation and this warbird too. This article and the experience that fueled it are not about the plane. It's about the men and women who served and sacrificed so that we may live free of tyranny and oppression. It's about never forgetting what they did for us then and now. ...Never forget. After bragging recounting my experience aboard Panchito to my father (a Korean war era veteran), I learned that my Great Uncle James Burks was a B-25 pilot during WWII who flew missions in North Africa. I never heard him speak about this though he passed away when I was quite young. Unfortunately, his stories during the conflict are buried with him as he did not even share them with friends or family. My Dad, now 86 years old and sharp as ever, described to me his own attempts to find out about experiences from family who served during WWII: “It was quite common that a lot of the returning servicemen (who saw action) did not talk about their experiences in the war. My cousin Joe was in the battle of the Bulge...never talked about it; only to his brother Rocky. Burks was a pilot and also flew in the air national guard after the war. When I spoke to my brother Joe about the war and some of the action he was involved in he didn't want to talk about it. One of his close friends was in the marines and served in the Pacific...never wanted to talk about it. Those were different times compared to today...all those guys are now deceased and their stories are buried with them.” Burks was either a 1st or 2nd lieutenant. I don't remember which. Because he was so tight lipped I could not find out much; the war was not a pleasant subject. All I remember was North Africa and state-side duty; he didn't say much about anything else. The same with my brother Joe. He would tell me a little, his ship torpedoed, being in the water for almost a day, 10 weeks in the hospital, part of the invasion fleet during the invasion of Sicily, being in the Pacific and then going to Japan. Pretty skimpy for 4 years of service, seeing action, being wounded. He [Burks], like a lot of guys, including my brother Joe (who got the Purple Heart) didn't talk much about their experiences during the war. All I know was that he flew the B-25 medium bomber and was in North Africa during the American invasion of North Africa and then returned to the states. Apparently he didn't fly in Europe. He spoke very little about the war and his experiences. My brother Joe was the same...It was only after his death that his son, Jay, found out that he got the Purple Heart. I knew because Joe and I were pretty close...not even my parents knew. I'm sorry, but that is all I know. I never pressured Burks about the war...the same with Joe.” I count myself as very fortunate to have had this opportunity to speak with Larry Kelly and to fly aboard his B-25J. Larry recounted terrific details of the original Doolittle Raid (not what you saw and heard in the movies) as well as his own personal history with this fantastic warbird and his special connection and support of our nation’s veterans. Larry’s efforts to maintain this icon of military history is a tribute to the veterans of past and present and their sacrifices. It also serves as a lasting reminder to us all that Freedom is not free. I was pleasantly surprised (relieved?) to find that my flight aboard Panchito felt very safe, secure and solid. 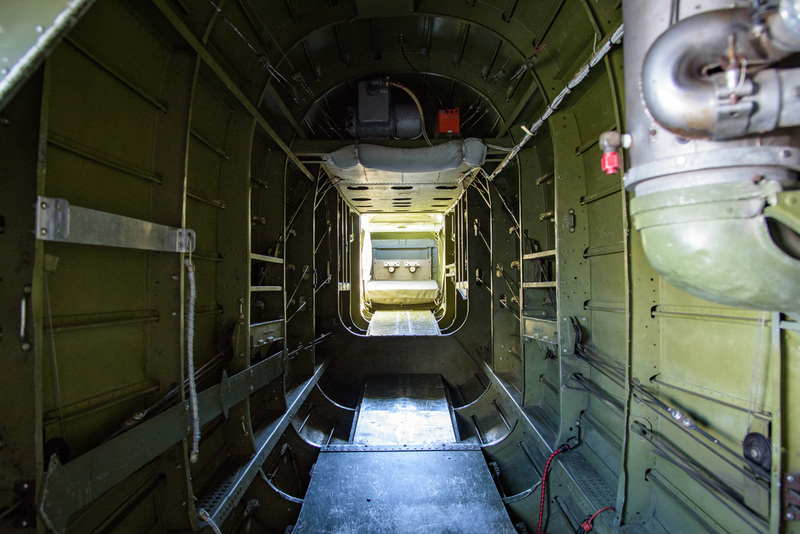 The aircraft is meticulously maintained inside and out as you can no doubt see in every one of the accompanying photos. 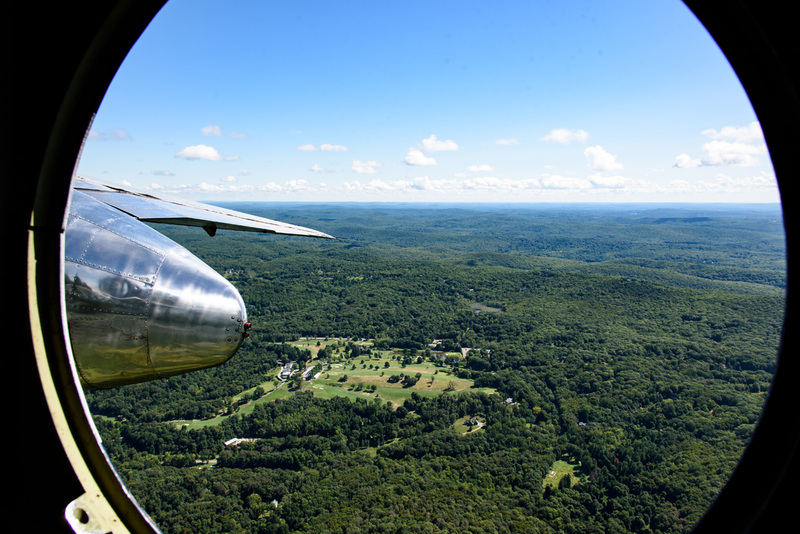 I was seated just behind the left wing during takeoff and landing, but was free to roam inside the tail section during our flight. 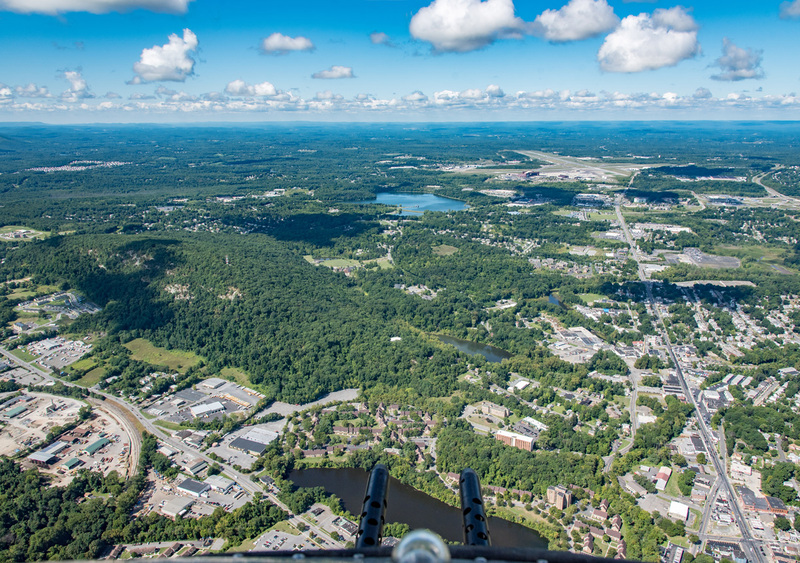 I crawled back into the tail gunner station to take some photos of our flight near West Point and was pleased to find an open section of the canopy that easily allowed me an unobstructed view with my lens! I found Larry Kelly’s remark contained within the civilian history regarding the noise in the B-25 right on the money! He described it as follows: “…the noise level on the flight deck during flight, especially on take-off. Imagine you have a metal bucket over your head with two jackhammers attacking each side of that bucket. 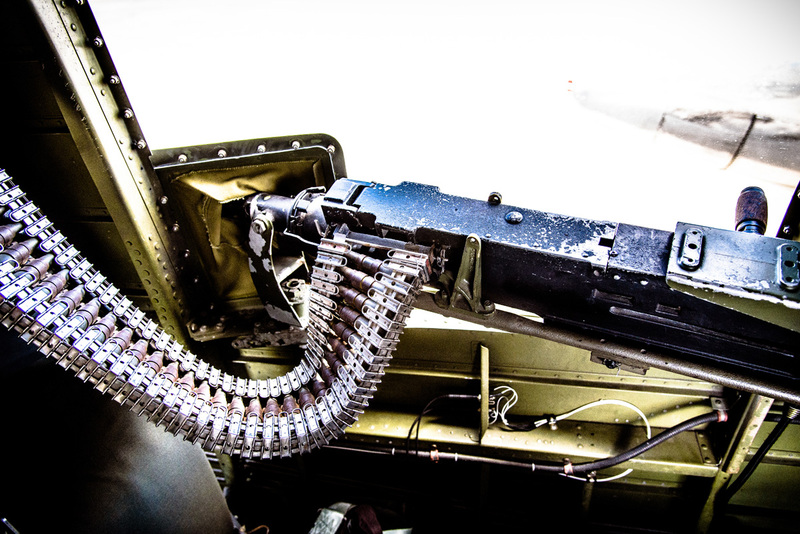 That is what it sounds like in the B-25! Now I know why most of the men who flew these airplanes wear hearing aids.” To hear what it sounds like to be inside a B-25J right before takeoff and while flying at 1500 ft, check out these recordings from Panchito: Click Here to listen to Panchito's engine start up prior to takeoff (MP3) Click Here to listen to Panchito during flight at 1500 ft (MP3) My thanks go out to Larry Kelly and his crew. Not just for the flight, but for what they represent and what they do every day to keep the history and the human connection alive. The next time you see a soldier, take a moment and thank them for their sacrifice and for their service. They deserve it. For the full history of the original Panchito, check out: http://www.delawareaviationmuseum.org/aircraft/b-25.html Background on the restoration of the the present day Panchito, B-25J, serial number 44-30734, can be found here: http://www.delawareaviationmuseum.org/aircraft/history_of_44-30734.html Panchito’s civilian history is described here: http://www.delawareaviationmuseum.org/aircraft/civilian_history_of_44-30734.html Panchito represents the Disabled American Veterans (DAV) Organization. For more information - please visit http://www.dav.org/ For more information about how YOU can soar on the wings of history and get a ride in Panchito, please visit: http://www.delawareaviationmuseum.org/damf/warbird_rides.html 44-30734 Panchito - Delaware Aviation Museum in Georgetown, Delaware I wish to express my heartfelt thanks to Larry Kelly, Angela Leedy, and Matt Sager for the fantastic opportunity to board Panchito and get a firsthand experience of flying history. I would also like to thank Cathy Bassett and the NY Air Show for their efforts and enabling media access during the show’s events.